Small enough to enter human cells, they can also affect the immune and nervous systems. PARIS: Global warming has boosted the frequency and severity of deadly air pollution peaks in northern China, scientists said today. Toxic particles in the air cause nearly a million premature deaths in the country every year, according to earlier research. "Climate change increases occurrences of weather conditions conducive to Beijing winter severe haze," a team reported in the journal Nature Climate Change. In Beijing and other major northern cities, the number of days each year with weather tailor-made for extreme smog rose from 45 to 50 in the period 1982-2015 compared to the previous three decades, a ten-per cent jump, the study found. The trend is set to worsen if warming continues unabated. Persistent episodes of health-wrecking haze would become another 50 per cent more frequent -- and last nearly twice as long -- during the second half of this century, the scientists found. The main danger, experts agree, is particle pollution, especially toxic, microscopic flecks smaller than 2.5 micrometres in diameter -- about 40 times thinner than a human hair. The burning of coal, along with vehicle emissions and dust, are the main sources of these ultra-fine specks, which can cause severe respiratory problems and increase the risk of heart disease. Small enough to enter human cells, they can also affect the immune and nervous systems. In major cities across northern China, the number of days with "severe haze" jumped from 12 to 18 to 25 during the winters of 2014, 2015 and 2016 respectively. Severe haze days happen when the concentration of small particles exceeds 150 micrograms per cubic metre of air. In January this year, a thick blanket of sun-dimming haze settled over the Beijing-Tianjin basin -- home to more than 100 million people -- for eight consecutive days, causing tens of thousands to flee cities and vent their anger on social networks such as Weibo and WeChat. For several days running, the density of particles 2.5 micrometres or less was higher than 500 micrograms per cubic metre, more than three times the danger threshold set by the World Health Organisation. 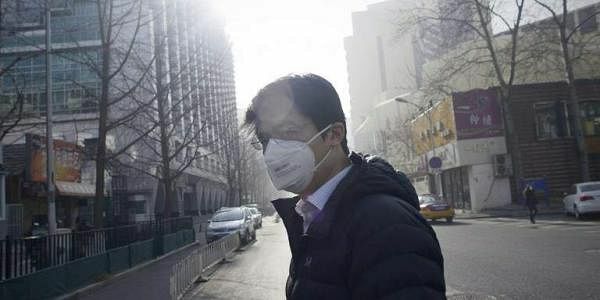 "I would rank air pollution as the number one or number two concern of ordinary people in northern cities in China," co-author Hong Liao, a researcher at Nanjing University's School of Environmental Science and Engineering, told AFP. A report by China's environment ministry last year showed that 265 of the country's 338 biggest cities failed to meet new health standards for small-particle pollution in 2015.